Our new Alden slip on boot in Color 8 shell cordovan is quite the sight to behold. The elegant plain toe vamp practically begs you to add a mirror shine. Our favorite part about this boot? It's hard to say. 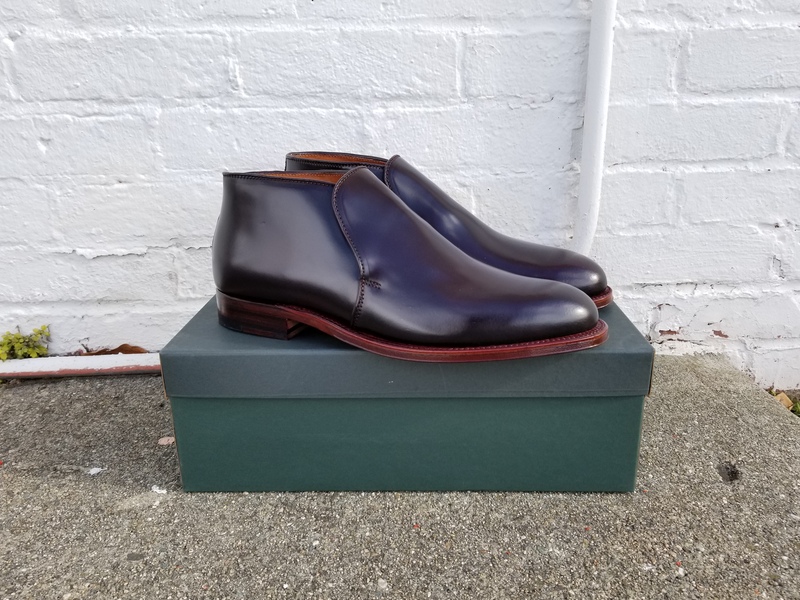 Between the sleek, smooth surface that really shows off the shell cordovan leather, the antique edge, and the ease with which they can be put on or taken off--we're at a loss. What we can decide on is that the Alden D8709 is a handsome boot. See for yourself by exploring our 360-degree view and watch how it catches the light! This boot is made on Alden's Aberdeen Last. We recommend going with your true dress shoe size. Formal enough for dress occasions, this boot does just the trick when you want to keep your ankles warm. While Alden defines the D8709 as a boot, it hits a bit lower than Alden's iconic chukka boot. It has a similar height to a 5 or 6 eyelet oxford. This makes it a great option for those that would like to travel with something a bit more formal than a loafer. The D8709 slips on and off easily, but still looks great with a suit! Cordovan is so much more than a color. Genuine Shell Cordovan leather comes from a membrane located in the hindquarter of the horse. Two oval pieces from this one horse will make just two pairs of shoes. The tanning process is done "the old fashioned way" at the Horween Leather Company in Chicago and the entire process takes at about six months. 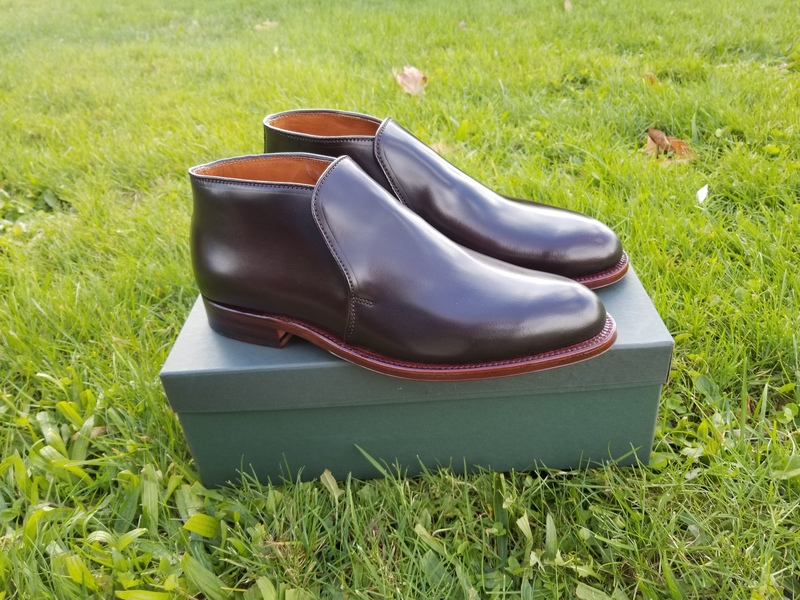 The resulting pair of shell cordovan shoes will be durable enough to stand the test of time and comfortable enough that you'll want to wear them as often as possible. So what is Color 8, exactly? Color #8 is the term Horween uses to refer to the deep burgundy hue used on Alden's shell cordovan shoes. The number 8 comes from the amount of times the leather is dyed in Horween's secret red dye formula. This deep burgundy color pairs well with a variety of outfits and looks great in sunlight. Want to see what else is new? You can explore our full selection of Alden Shoes here.